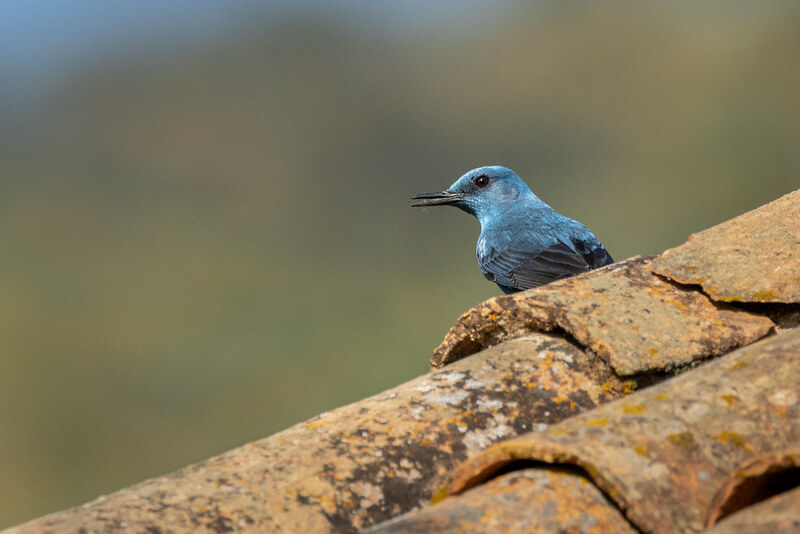 Yesterday afternoon I dressed up in my Army clothing, took my camo-bag and tried to sneak close to the ruin that the pair of Blue Rock Thrushes are nesting in. It didn’t go well, the male was sitting at the location I was trying to get to and even though he moved away I think he was watching me and seemed uncomfortable so I abandoned the idea. Back at the house it got me thinking, earlier in the day he was less worried when I walked through with the dog in normal clothing. 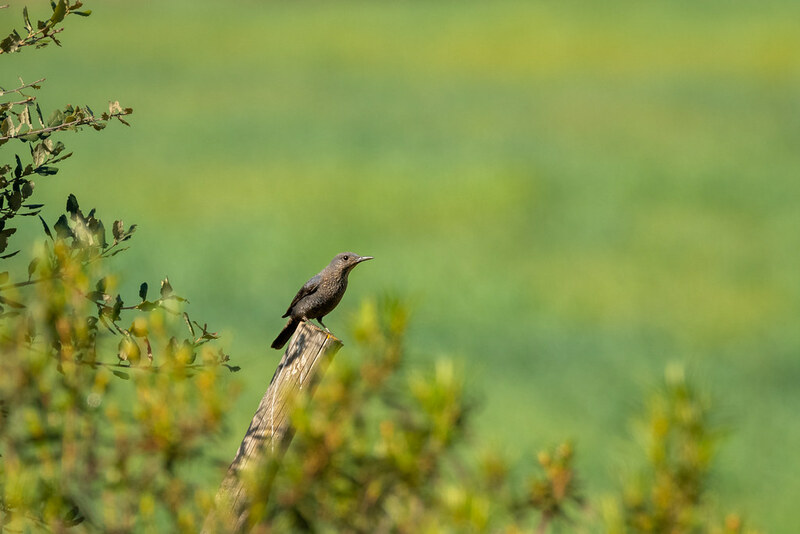 So this morning, I tried something different, I put a 1.4x teleconverter on my 500mm lens (which gives me a 700mm with minimal quality loss on such a great lens) and took it out using a Monopod rather than a Tripod for ease of carrying. 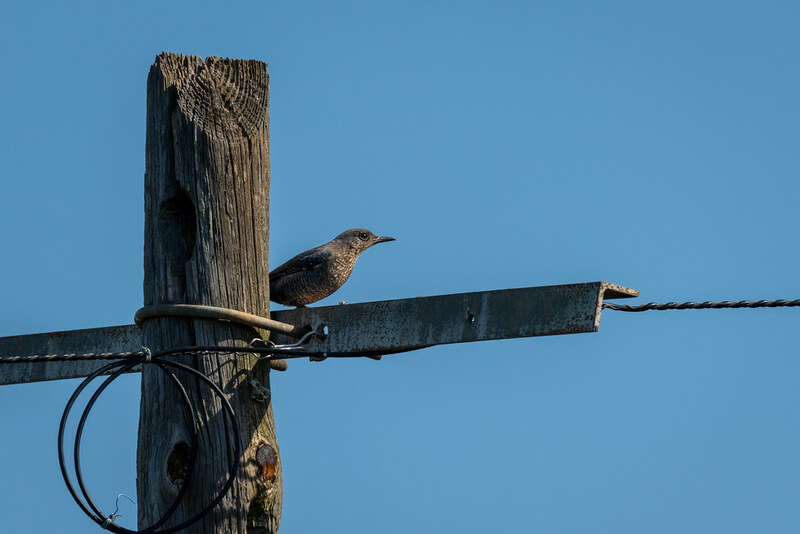 I walked my usual route and the female was sitting on a nearby telephone pole and I could see the male on the roof of the ruin. I positioned myself near to the ruin in full visibility of the birds. They seemed far more relaxed with my presence, the male even more so as he came to the roof top. Although not the perfection I’m looking for I did come away with some nice photos. 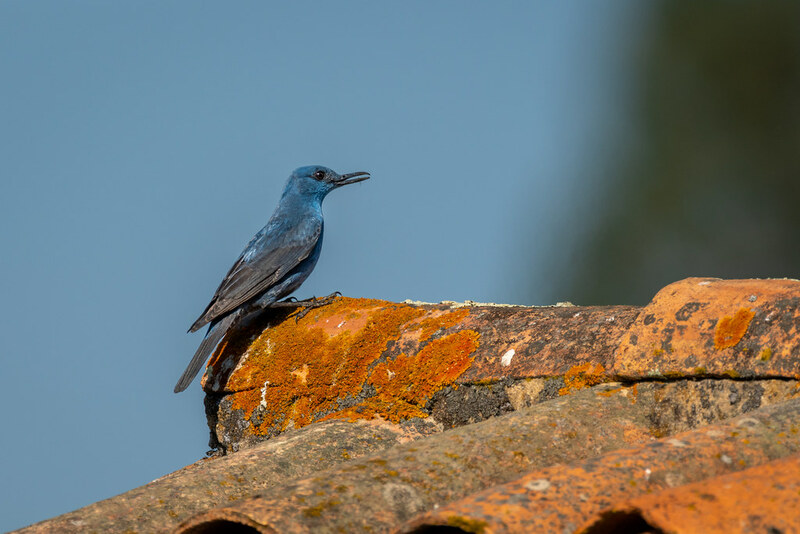 The female was a little less confident, she would return to the roof but remain out of sight on the other side of the building but she would perch on a nearby fence post. I keep asking myself whether they are more relaxed around me because I’m not trying to hide. Are they more intelligent than we think and they associate me in my camouflage gear as a hunter which are active in the winter seasons in this area? As you can see the male is in full breeding colour, in the winter they are a little less saturated, the female is very easily mistaken for a female Blackbird except for the much longer beak. I noticed they kept returning to the same part of the roof over and over so I moved away to watch them and confirmed my thoughts. They have selected a hole in the wall of the ruin as a nest spot, this ruin has a huge population of House Sparrows and they want this prime location. The male and female Blue Rock Thrushes take it in turns to chase away any House Sparrow that wants the nest spot. 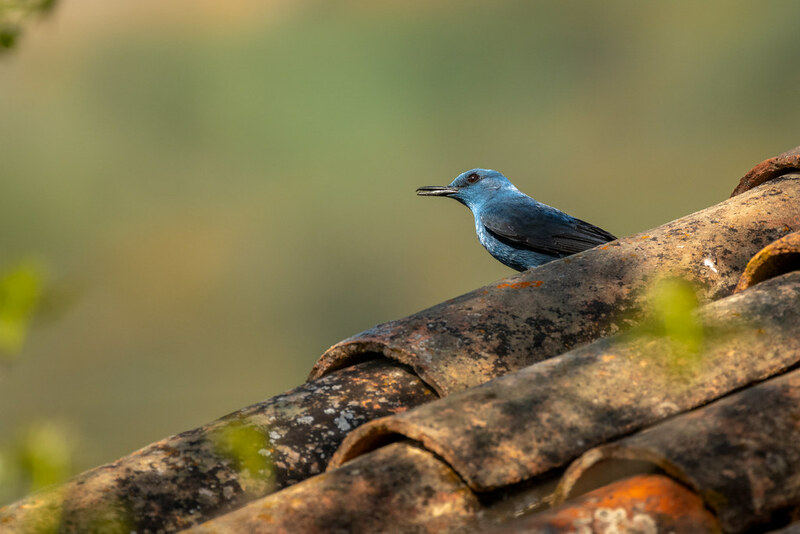 Although not a rare bird, Blue Rock Thrushes (Melro-azul in Portuguese) are not commonly seen and as you have probably worked out I’m a little obsessed by them. I am working out my next steps as I want to keep photographing these and hopefully any babies they bring into the world. It is the perfect location to place a hide, but I don’t own the land and also don’t want to create any unwanted attention, so I’m trying to work out a way to build a natural hide amongst the surrounding Esteva plants. Morning Dog Walk: Males Singing and Drumming For Females…..And, Of Course, Bluey!